Stars viewed by an observatory in South America have just lost their twinkle. Images from this ground-based telescope are brighter and clearer than ever before, thanks to a new instrument on the Gemini South observatory that reduces the blurring, or twinkle, caused by Earth's atmosphere. Earth's atmosphere may create beautiful sunsets, but the movement of warm and cold gases makes seeing distant astronomical sources a challenge. By relying on a combination of light-wave sensors and deformable mirrors known as adaptive optics (AO), astronomers have been able to subtract out the turbulence, improving their images. Numerous telescopes have already been fitted with adaptive optics systems, but a recent upgrade to the Gemini South telescope, located in Chile, takes adaptive optics to a new level. Gemini is a collaboration between seven member countries: the United States, the United Kingdom, Canada, Chile, Australia, Brazil and Argentina. Some proponents of the telescope are hoping the new system will help pull the observatory out of a productivity rut, according to Nature News. Compared to other facilities of comparable size, such as Subaru and Keck of Hawaii, and the Very Large Telescope in Chile, Gemini has produced significantly fewer scientific papers every year since 2005, Nature News reported. However, its groundbreaking new optics system could change that. Like many other systems, the Gemini Multi-conjugate Adaptive Optics System, or GeMS, doesn't rely on luck to provide it with an ideal star to calibrate its measurements—it uses lasers to make its own. 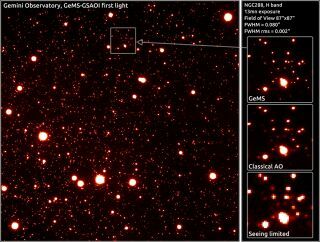 "We use laser guide stars instead of natural guide stars because it's very difficult to find several bright stars in the patch that can be handled by MCAO," Francois Rigaut, Gemini Adaptive Optics senior scientist, told SPACE.com in an email. "The probability is basically zero." By determining how much the laser guide stars have blurred and changed, astronomers can calculate the atmospheric turbulence that makes the stars and other distant sources twinkle, and remove the distortions from the data. The resulting images are a significant improvement over previous ground-based images, the researchers said. In a statement, Rigaut calls Gemini's new photos "Hubble-quality," a significant step for a telescope stuck on Earth. "Large ground-based telescopes plus AO can provide a very attractive alternative to space, especially in the near-infrared," Rigaut said. "AO from the ground is several order of magnitudes cheaper than sending telescopes into space." But that doesn't mean that Gemini South will put the space-based telescopes out of a job. In addition to causing twinkling stars, Earth's atmosphere also blocks light in the ultraviolet wavelength and some infrared bands. Yet some of the universe's most interesting processes are only visible in these types of light, which can't be seen from the ground. "What is filtered can never be recovered," Rigaut said. "Space is not replaceable for many things," Rigaut cautioned. But in the wavelengths that adaptive optics works for, GeMS excels. All telescopes are limited by the amount of what Rigaut calls "detector real estate." "Whether you are in space or on the ground, you are mostly limited by the number of pixels you can put behind your telescope, or telescope-plus-AO-system," he said. "There, we're about on par with space." The Gemini telescope's new optics could help pave the way for better quality images from all branches of astronomy, including stellar evolution, star formation in nearby galaxies, black holes, and the study of the movement and composition of distant galaxies. GeMS can also provide more precise weather monitoring on Mars and Jupiter from the surface of Earth. And such a system isn't limited only to Gemini South. "The principle is generic and can be used on any ground-based telescope," Rigaut explained. So although GeMS is specifically designed for Gemini, other telescopes should be able to use a similar process. According to Rigaut, the Thirty Meter Telescope being planned for Hawaii, and the European Southern Observatory's European Extremely Large Telescope intended for Chile both have MCAO systems in the works. Pretty soon, the familiar children's song may need a new refrain.